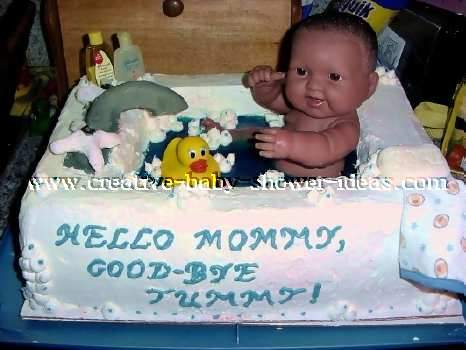 Come see the pictures of baby shower cakes and ideas submitted to us by our readers. 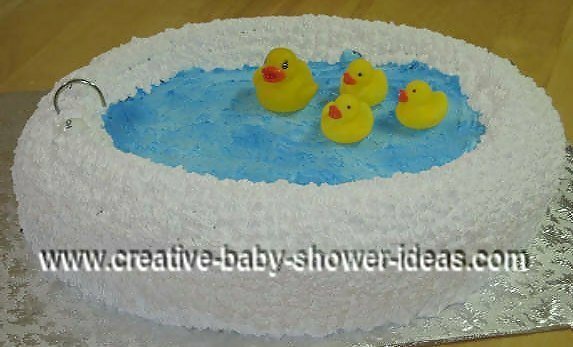 This section has ideas for bathtub cakes. To see other categories, just click on the edible cake index link below. If you end up making a cake we would love to see it! You can share your photos and tips with us here. Why should you buy a cake pan on eBay? Why pay full price if you will only use the cake pan once or twice? You don't need to worry about being burned. The seller rating speaks for itself. Great selection! 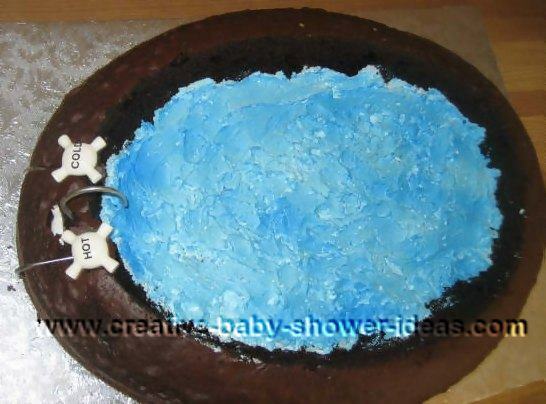 Chances are if the cake pan exists, you will find it on eBay. I took an 8 inch round and two 9 inch rounds and stacked them together. I made the wood out of fondant and gum paste. 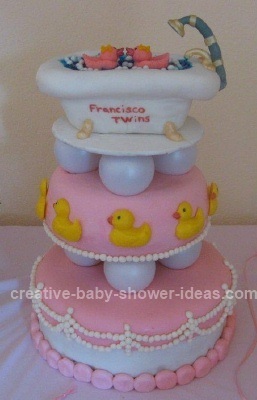 The rest are fondant (baby, duck, and towel). Mix and Bake the cake batter in an oval pan as instructed on your recipe. (I used French Vanilla Cake). After the cake has had ample time to cool in the pan, flip it onto a Cake Cardboard. Then hollow out an oval whole in the center 1/2 way with a spoon (that will be the tub basin). Make or buy the frosting and frost the entire cake white (I used a vanilla Swiss buttercream, for a fluffy texture, but any can be used). 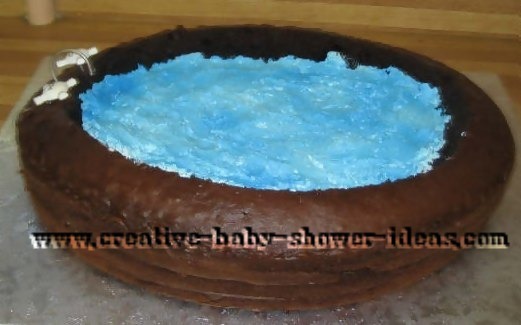 With the rest of the icing color it blue with food coloring and make wave like strokes in the center, mimicking water. Take some white rolled fondant and create a faucet, and two handles (you can decorate them any way you'd like, I used Dragees or little gold balls to Identify Hot and Cold). 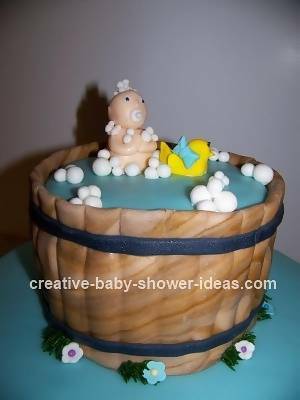 Roll some rolled fondant into balls to create bubbles and randomly place them around the tub. Roll out a square piece of fondant and carve the word SOAP into it and place on the cardboard (Lettered cookie cutters work great!). Place a rubber ducky, or duckies in the water. 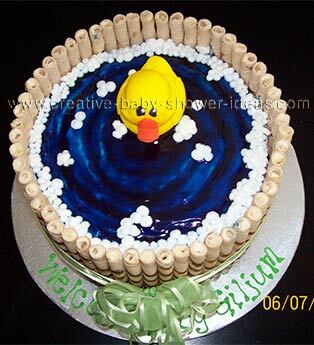 Next using a piping bag and a tip create a border around the entire bottom of the cake. And if you would like you can write a message (In this case CONGRATS). 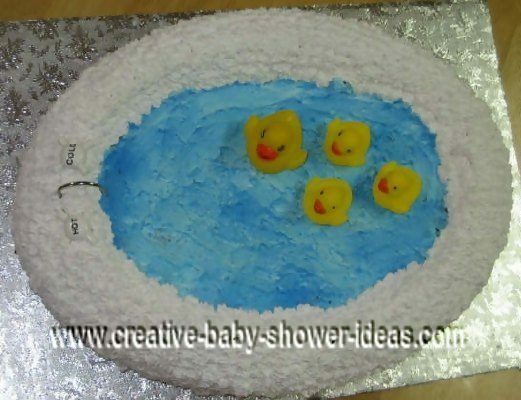 This baby bathtub cake is made with red velvet cake and cream cheese frosting. Use a large Wilton 12X18 baking pan. Make one layer as a whole layer. You will then take the 12X18 pan and make 3 top layers by placing a 9X13 pan in the center and filling the 12X18 pan with the cake mix. This will give you the bowl of the tub. You will then line the bowl of the tub with some plastic wrap and fill with blue jello. 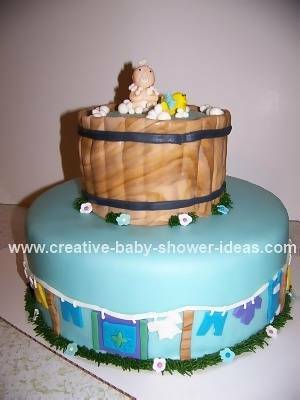 Once you have done this, you will cover the cake with cream cheese icing and then apply another coat of white icing to make the white tub. If you want an ivory tub you can just leave it as cream cheese. The faucet is made from rolled fondant and dyed. You can use the Wilton stencil set to create the word soap on your fondant bar of soap. 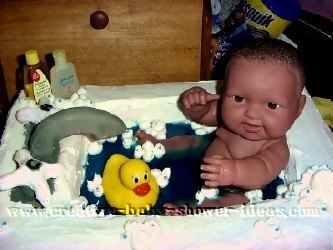 You can use a brand new washed baby cloth and travel size baby wash and shampoo as decorations. You can place bubbles on the cake using any size round tip. And if you wish you can add some flair by placing small blue dots on some of the bubbles. Use a good sized oval pan. Make two cakes stacked together. Dig out the middle to make room for the water. I used whipped icing, spread around to make the waves. Color with blue spray coloring. 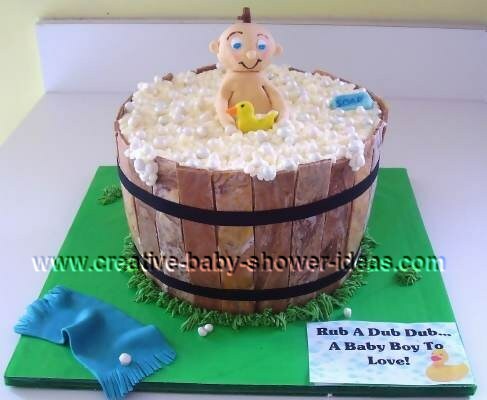 Cover the tub with white icing. The faucet and taps were actually shower curtain hooks that I found in the bed and bath section of Walmart. Rubber duckies give it a finishing touch. I made 3 10 in cakes and iced them. I let the icing set a while, then made swirl indentations in the top for the ripples. Then, I colored some piping gel blue and covered the top of the cake in it. I formed a duck from fondant and placed him in the water. 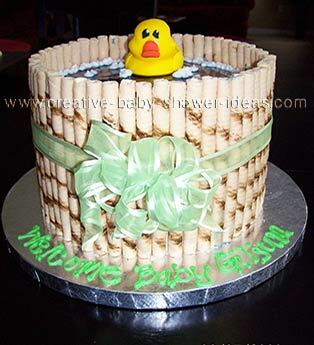 Then, just stick wafer sticks around the outside and tie a bow around it.... and voila! 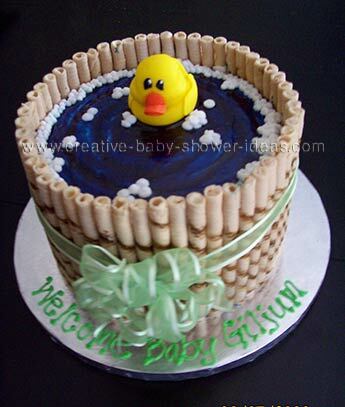 The family asked me to make a specific tub on the cake so that it would match their baby shower invitation. 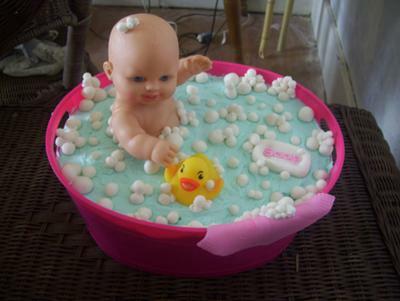 So I made the tub out of rice cereal treats that I molded iced and covered in fondant. For the ducks on the second tier, I used candy molds and then painted their eyes. For the balls on the third tier, I used a circle cookie cutter and handmade each ball individually. I really had fun and enjoyed making this cake. This cake was for a friend down the street. 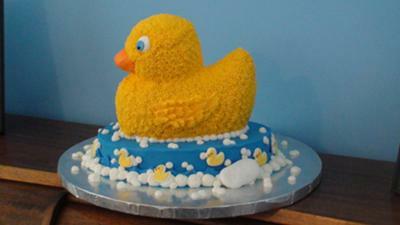 She loves little rubber duckies, so this cake was great for her. The cake is all buttercream except for the bar of soap, which is made from fondant.